Prove It! 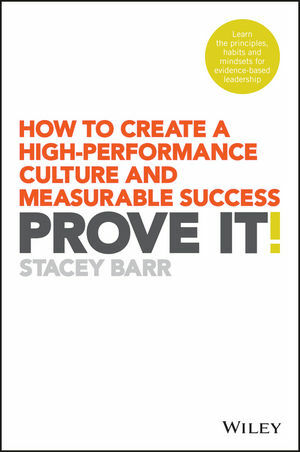 is the executive guide to improving organisational performance through the practice of evidence-based leadership. More than ever before, the world is demanding transparency and accountability from organisational leaders, and there is a growing push to hold leaders responsible for the performance of their organisation. Many executives panic at the thought of what transparency might reveal and how they might be held accountable, but others relish the opportunity to showcase their organisation's performance. The difference is in the leadership methodology. The best leaders already know how their organisation is performing, and that it has improved during their tenure – and they can prove it because they practise evidence-based leadership. This book offers a clear blueprint for building on your existing skills and performance management systems to build a truly high performance organisation. If an organisation can only be as good as its leadership, it's reasonable to place the burden of performance responsibility on those who make the decisions. A leader's job is to inspire, motivate and guide, and those who do it well are already raising the bar. Prove It! gives you a practical model for measurable, real-world results, starting today. STACEY BARR is a performance measure specialist and creator of the PuMP® methodology. Known for her practicality in making performance measurement easier, faster, meaningful and engaging, Stacey is also the author of Practical Performance Measurement. Find out more at www.staceybarr.com.